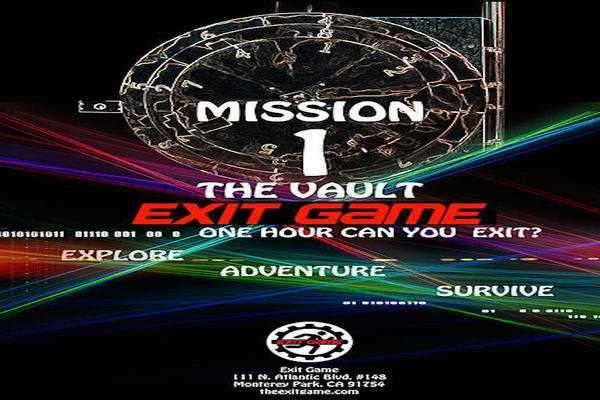 Reviews of escape game "Mission 1. The Vault"
really fun experience. worth every penny! we did the chamber (the hardest room) and finished with time to spare. it's definitely a challenge, but if you have a big group (especially one filled with lots of video game lovers) you can definitely do it. 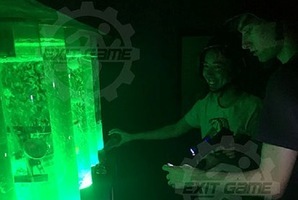 First time at Exit Game, came with a group of 20 friends and each of us paid $25 but I feel that it is overpriced for the quality of the game. Not impressed with the service. Once we got there, we were asked to pay. Waiver form is left on the table and no one else informed us to fill it up. I'm sure first timer like me would not have know that we have to fill that up without anyone informing us. Our group did Mission 1: The Vault, and was brought to the room by the staff who explained to us on the Dos and Donts. The first room we walked in, there wasn't even a door, it was just a cheap curtain to walk into. I was expecting us to be "locked in", that's the purpose of the game isn't it? Having an easy access to walk out kinda defeats the purpose of the concept of "Exit Game". The puzzle/game was made up of simple props. Was expecting for a more challenging puzzle to solve especially for a big group. The digital clock is not available in all the rooms, so how are we supposed to know how much time we are left with? We have to go all the way back from the 3rd to the 1st room to look at the clock. It's definitely not worth coming back again. This puzzle room is a bit different than others. They have a huge lobby/lounge area. There are lockers for personals. You cannot bring any electronic devices (like all places). We had a pretty large group for Mission 1: The Vault which I wouldn't recommend. A good group size for this would be 6 people. This mission is linear, so you cannot have different people do different things. When the group is so large it is difficult to solve the puzzle. Staff will not be present with us in the room and they will only give you ONE hint when you ask for it. When we were stuck, the hint they gave us was not helpful at all. This mission will require some math, but there's no pen and paper. So don't mess up on the simple math! Also, be prepared to spend majority of the time in the dark. Once done, they only explain what we need to do up to that point. They won't go over anything because they want us to come again. This place is okay. IMHO, it's still better than PanIQ Rooom! The staff could have been more enthusiastic and execute everything better. This was my first live "Escape Game" experience. It was a really fun thing to do with a small group of friends on a weeknight! We did the "Vault" room, which was apparently rated "medium" in difficulty, but we failed it. Without spoiling much about it... it was actually VERY challenging. I went with 2 friends (one of which had done an escape game before, someplace else). His critique was, in comparison, this one was too heavily based on numbers and math (which I completely agree with). My other friend was disappointed with the design/construction of the rooms, more from a style perspective than a game perspective (which I also kind of agree with). Otherwise, we definitely were challenged with the difficulty of the puzzles. I personally wish there was a stronger story element to our puzzle and that there was maybe a way to interact with the people who worked there a bit more in some way, whether it be a character element or something like that (for instance, maybe someone is dressed on a police uniform or there is some pre-recorded element that gives you an idea of what could be happening in the world outside of the game area. This could add to the suspense. We also all agree that there should be time clocks in all of the areas of the course, as you are not allowed electronics and can easily lose track of time once you are past the first room. Either that or some other way to clearly note how much time you have left. All in all, we had a great time and I would recommend Exit Game to someone else. I just feel genuinely let down that we didn't beat it. I feel we definitely could have with a little bit more time.